Hake, Scallops, Oysters, Lobster, Salmon, Trout and Sea Bream. ... just some of the amazing, tasty choices up for grabs in Glasgow these days. 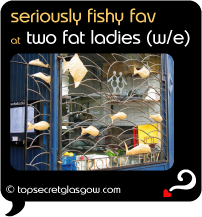 Carrying on the growth in classy eating seen all over our great city, the number of fish specialist restaurants keeps locals very happy indeed. Always fresh, well presented and under the guise of very strong relationships with suppliers, the very best fish arrives on our plates every day. Gamba serves up an exciting menu in superb golden-glow surroundings. Step into Gamba for a treat; whether its pre-theatre, romance or business. Great news! Finding this page means you can now join our VIP list for EAT Fish. Time to grab your very own page for EAT Fish.